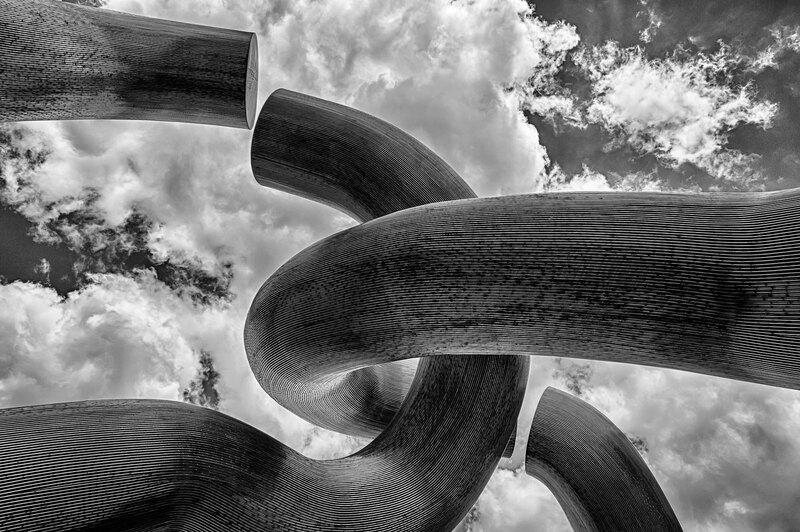 My Flickr contact Werner Schwehm posted this dramatic image of steel sculpture from below, taken in Berlin, Germany. Another great perspective image. 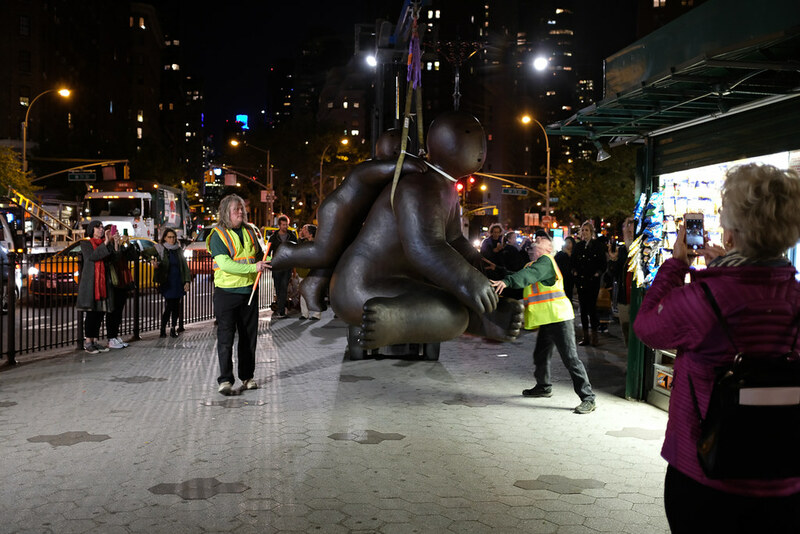 New Yorker staff writer Paige Williams came to the installation of Joy Brown’s sculpture on Broadway but weren’t sure if the Talk of the Town piece she was working on would make it into the magazine. It did, and hopefully it will bring even more foot traffic to Joy’s amazing work. I did watch her frantically scribble on her notepad when the driver of the flatbed transporting them down from Bethel, Connecticut said: “I could’ve drove here naked and nobody would’ve noticed.” I thought it might be the lead, I was off by a paragraph. My good friend Joy Brown has been making large bronze castings of her ceramic sculpture and is having a show of them in New York City. Joy has been traveling to China to work with a foundry there for many years and these finished pieces were shipped to the US in a large container by ship and arrived a few weeks ago. There will be a sister show in China opening in a few months. We pulled an all-nighter last night helping with the installation which was done by a great outfit out of Bethel, Connecticut: Mariano Brothers. We started at 10:00 pm and finished at 3:00 am. 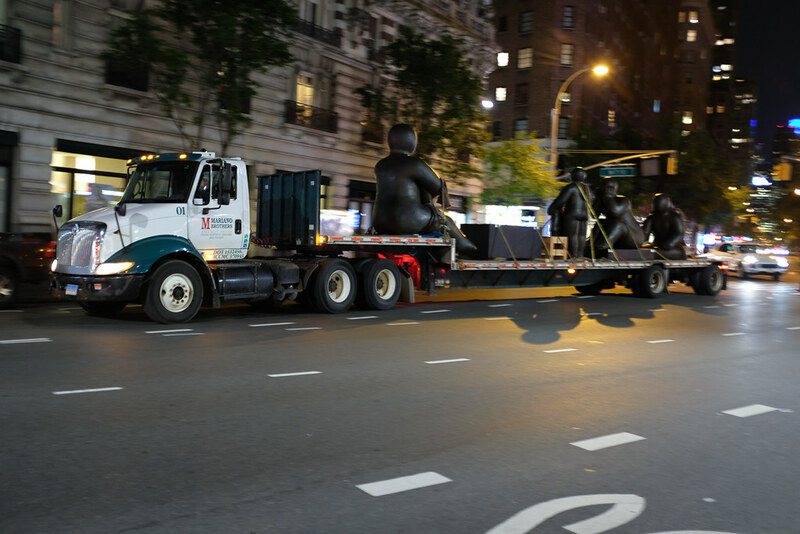 There were two flatbed trucks, ours with four pieces starting at 72nd St. and working north, the other starting at 168th St. and working south. Mother and child at 72nd St. Many of Joy’s friends came from all over the country and they were joined by a crowd of curious and supportive New Yorkers. It was quite a scene although after midnight as we moved up town only the core group remained. 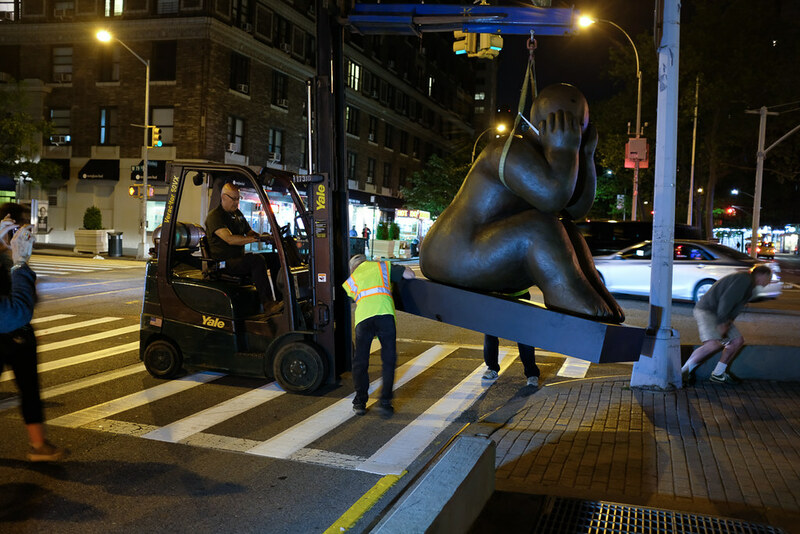 Tomorrow, Wednesday May 17th there will be a formal “opening” at 11:00 am at the 72nd St and Broadway installation. The show will be up for at least six months, maybe longer. Each setting has a map showing the location of each of the sculptures. 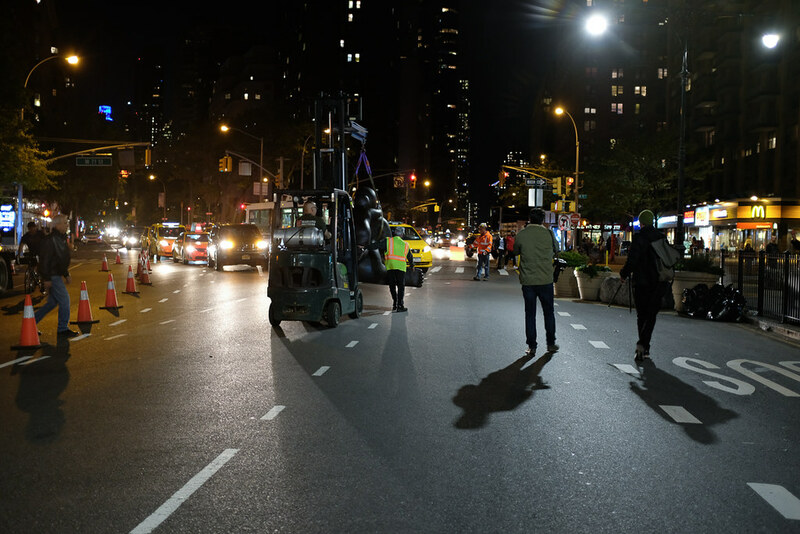 It’s a bit of a hike to walk the whole thing but there’s a subway line running under Broadway and the pieces are near enough to stops so they can be easily gotten to. BLOOMS 2: Strobe Animated Sculptures Invented by John Edmark from Pier 9 on Vimeo. John Edmark is a sculptor and Blooms is a series of 3D printed sculptures designed to animate while spinning under a strobe light. The video and background music are quite amazing. Zoom it out for full effect. “With zero experience welding or creating art, Gary Greff began building the world’s largest metal sculptures and placing them along the “Enchanted Highway,” or Highway 21 in Regent, North Dakota. By 2006, Greff had completed a total of seven mammoth sculptures for the 32-mile stretch of road. All are thematically related to the western North Dakota’s cultural and historical roots. For instance, in one sculpture Teddy Roosevelt dominates the rolling hills, while in another, grasshoppers five times the size of a car feast on golden wheat rising from scoria rock beds. 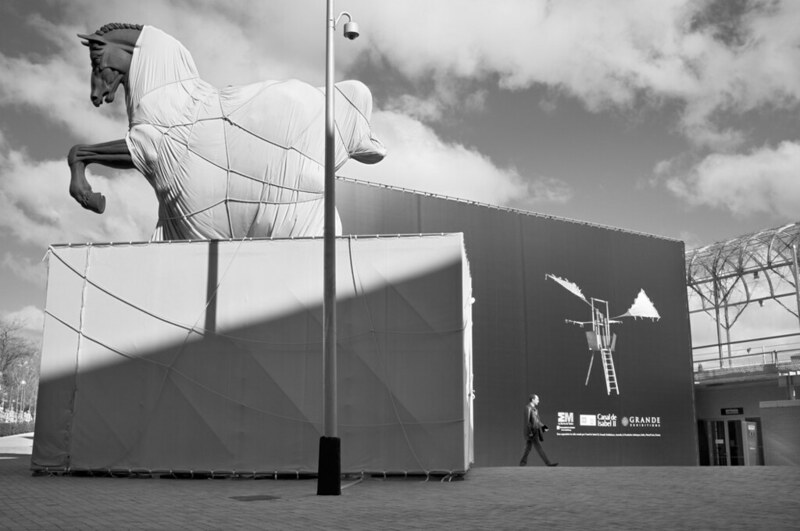 My flickr contact c a r a p i e s posted this image of a piece of sculpture under wraps in Madrid, Spain, taken with his Fuji X100. Flickr member Tom Knowles took this great image of a person standing inside a Richard Serra sculpture at Toronto Pearson International Airport. I did an image of my mother inside a Richard Serra six years ago: My mother inside a Richard Serra. 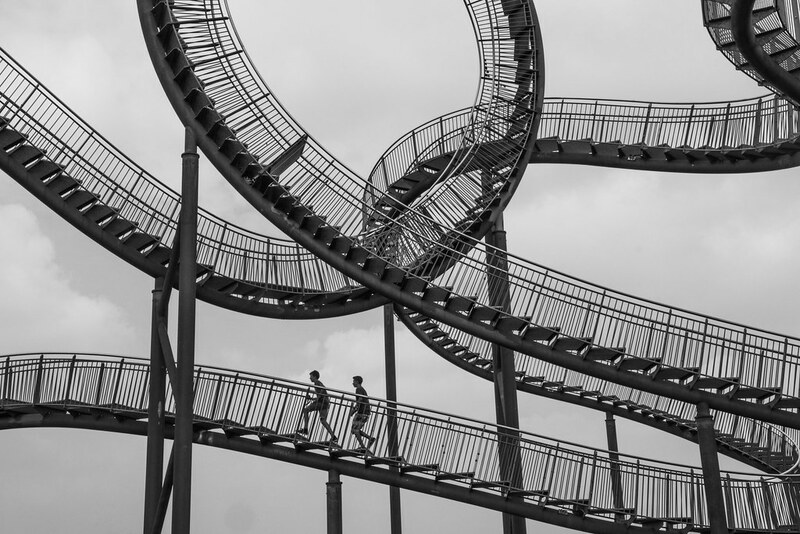 Flickr member Alexander Fink took this very well framed image at an art installation in Angerpark, Duisburg, Germany. 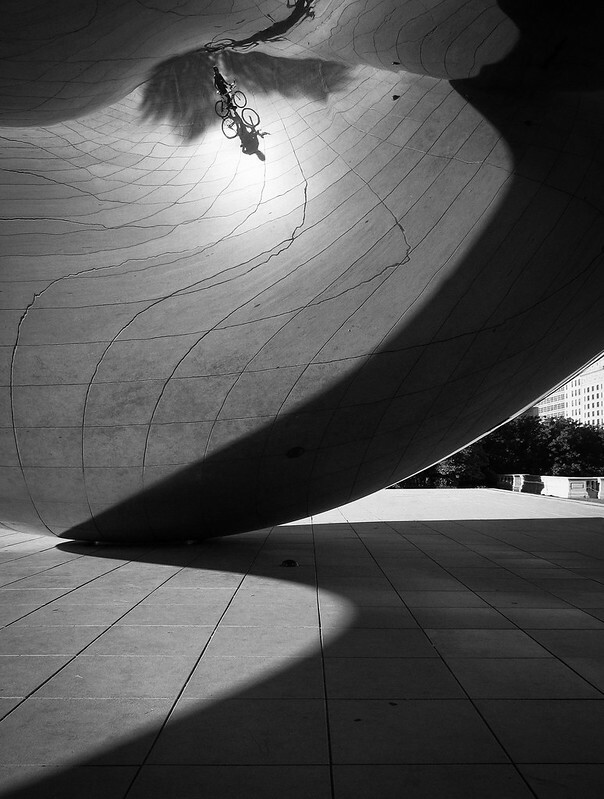 My flickr contact chris schroeer-heiermann took this dramatic image of Cloud Gate in Chicago, Illinois with his Canon Powershot S95. I’ve seen a lot of images of this piece of sculpture by artist Anish Kapoor but this one is one of the finest. 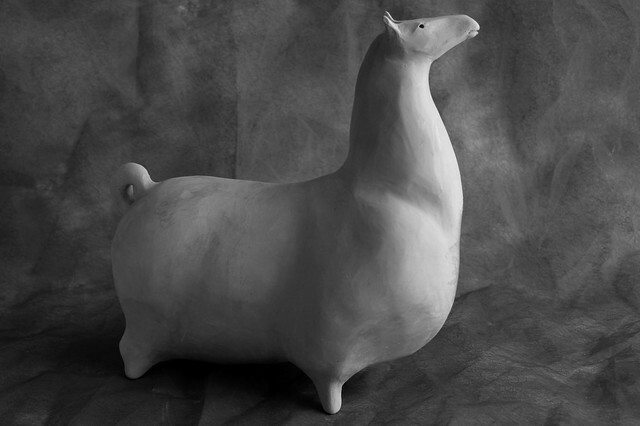 My flickr contact Iona has made a wonderful ceramic horse and photographed it beautifully.